Redblotch perchlet larvae (Plectranthias winniensis) were raised from wild-spawned eggs at 77-79F on cultured copepods and artemia. The larval duration was 80 days. First record of Perchlet culture (Plectranthias species). Plectranthias is a genus (comprising 51 recognized species) of small, cryptic hawkfish-like fishes with large mouths. Most species reach a maximum size of just 7.5 cm (3“) and occur at depths below 50 m (160 ft). With the exception of P. garrupellus in the Western Atlantic, the genus is restricted to the Indo-Pacific region. Juvenile Redblotch perchlet (Pletranthias winniensis) reared in the laboratory. 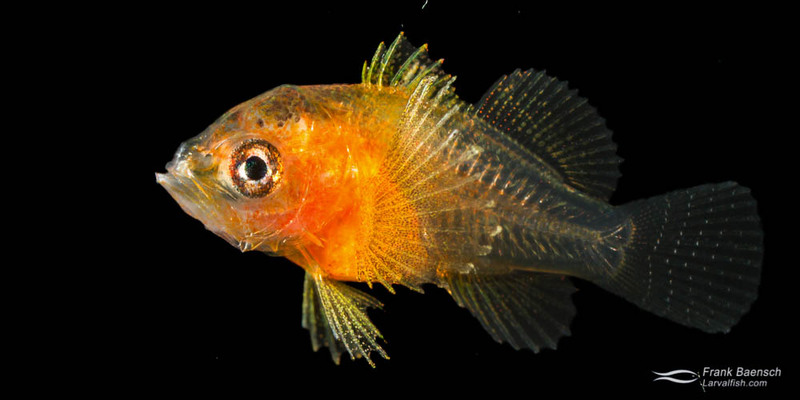 Redblotch Perchlet (Plectranthias winniensis) juveniles were raised in May 2014 from pelagic eggs collected in coastal waters off Oahu’s east shore. This is a small (5 cm/2 inches) and secretive species that is rarely seen by divers. It occurs in the Indo-Pacific from the Red Sea and East Africa to the Hawaiian, Tuamoto and Pitcairn islands and south to the Great Barrier Reef and the Austral Islands. Adult specimens have been collected in 23-59 m/75-190 feet for scientific purposes. This species is not available through the aquarium trade. P. winniensis eggs are spherical, clear and small (0.7 mm diameter), with a single oil droplet. P. winniensis larvae measure about 1.5 mm TL at hatching. They begin to feed three days after hatching (dph) (2.7 mm TL), undergo flexion near 16 dph (4.8 mm TL), and complete juvenile transition by about 80 dph (14 mm TL). Interestingly, P. winniensis larvae look very similar to scorpionfish larvae, developing very large pectoral and pelvic fins (the former lacks parietal spines) during the preflexion stage. P. winniensis larvae also develop intricate head spination, a specialization for pelagic life that is shared among all anthias. Redblotch Perchlet (Pletranthias winniensis) larvae reared in the laboratory. P. winniensis larvae delay metamorphosis and have a long larval phase, which makes them more difficult to raise than other serranids. The larvae were raised together with Pseudoanthias bicolor larvae using cultured copepods and artemia as live foods. This is the first documented rearing of a Plectranthias species.